IT G Provide probate valuations in accordance with HMRC guidelines. Probate valuation reports will be prepared within 5 days of our valuer’s visit and will provide a clear indication of the market value of each item within the estate. The valuation report will include images with clear and accurate descriptions enabling quick identification of items of value. The items pictured below are just a small sample of similar items recently valued by ITG probate valuations. The gallery will hopefully be helpful & educational in demonstrating the wide array of antiques, collectibles & everyday objects we value on a daily basis. 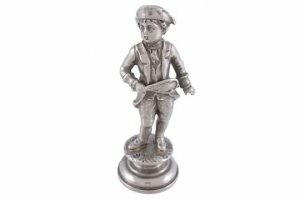 A 19th century silver coloured figural desk seal, modelled as a gentleman in late 18th dress holding a tennis racquet, the matrix engraved with the name Ada beneath a coronet. 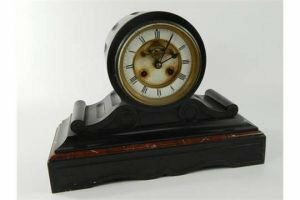 A late 19th century French black slate and marble drum shaped mantel clock, with a white enamel dial and Roman numerals, on a shaped plinth. 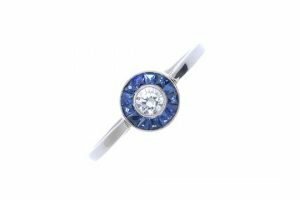 A sapphire and diamond cluster ring, the brilliant-cut diamond within a calibre-cut sapphire surround, to the plain band. Estimated total diamond weight 0.20ct. 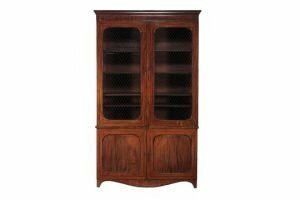 A Regency mahogany library bookcase, circa 1815, the moulded cornice above a pair of brass grilled panel doors enclosing adjustable shelves, the base with further panel doors enclosing an adjustable shelf, the whole on shaped apron and slightly out swept legs. 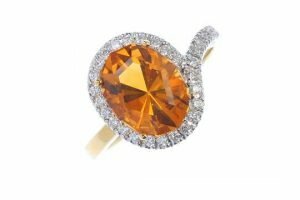 A citrine and diamond cluster ring, the oval-shape citrine within a brilliant-cut diamond asymmetric border. Estimated total diamond weight 0.30ct. 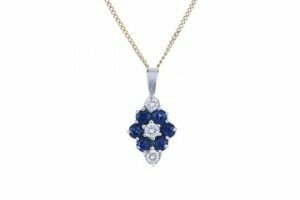 An 18 carat gold diamond and sapphire pendant and chain, of lozenge-shape outline, brilliant-cut diamond and circular-shape sapphires to the flat curb-link chain. Estimated total diamond weight 0.20ct. 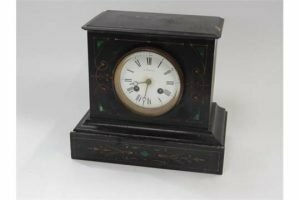 A Victorian eight day mantel clock, in grey slate case inset with malachite and gilt outlines, with white enamel dial signed R Russell. 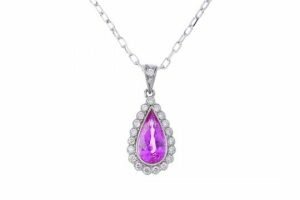 An 18 carat gold sapphire and diamond cluster pendant and chain, the pear-shape pink sapphire, within a brilliant-cut diamond border and similarly-set surmount, to the trace-link chain. Estimated total diamond weight 0.30ct. A Victorian turned ivory desk seal, the oval white alloy head and matrix with a lozenge shield of widow Baker of Radnorshire. 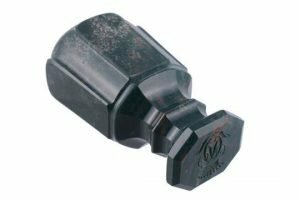 A 19th century bloodstone desk seal, tapered and panelled oblong, the matrix carved with a coronet and a cypher. 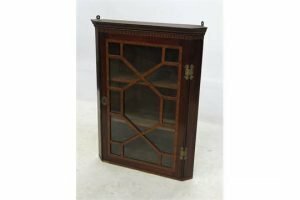 A small 19th century corner cupboard, with satinwood and bone inlay, the door opening to reveal two fitted shelves. 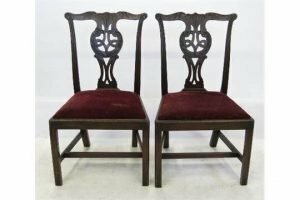 A pair of Georgian mahogany Chippendale design single chairs, with carved and interwoven central splats and carved central rail. 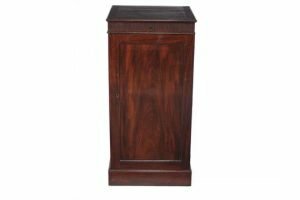 A mahogany pedestal cupboard, circa 1780, the lift top compartment with fluted frieze above panel door enclosing three shelves, raised on a plinth base. 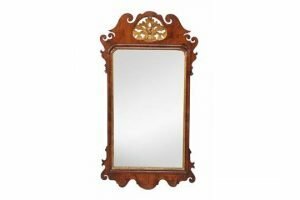 A George II mahogany and parcel gilt fretwork wall mirror, circa 1740, the rectangular mirror-plate surmounted by a pierced parcel gilt plume. 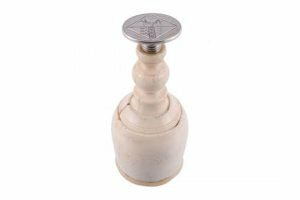 A 19th century turned ivory desk seal, the rounded button knop unscrewing to reveal a compartment, a baluster stem, with a white alloy head and oval matrix with a coat of arms. 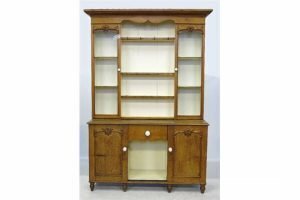 A 19th century light oak dresser, the upper section having two glazed doors, flanking open shelves, the lower section fitted with a central kennel section flanked by a cupboard to each side. 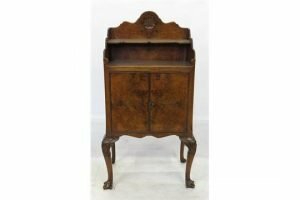 A reproduction walnut bedside cupboard, with bookshelf over, with a shaped frieze having two cupboard doors, raised on four cabriole legs. 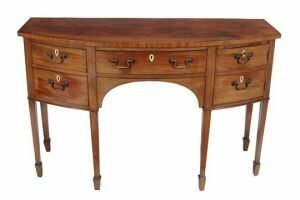 A George III mahogany bow front sideboard, circa 1800, the frieze drawer flanked by a cupboard and two drawers, on square section tapering legs and spade feet. 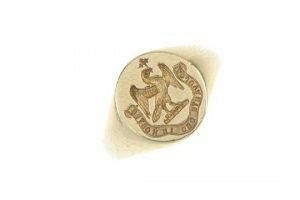 A gentleman’s 18 carat gold signet ring, the oval-shaped panel, engraved to depict an eagle crest to the plain tapered band. Hallmarks for Birmingham, 1999. 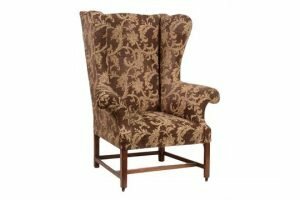 A mahogany wing armchair, early 19th century, with out swept scroll arms above overstuffed seat and chamfered square section legs joined by stretchers, on wooden castors. How do you apply for probate?